The idea of an obsessive-compulsive detective is not a new one. Most of us are familiar with the American TV series, “Monk.” The difference with Stephen Puleston’s North Wales detective, Inspector Ian Drake, is that Drake’s OCD isn’t played for laughs. His affliction puts a genuine strain on his relationships, his career, and his personal safety. 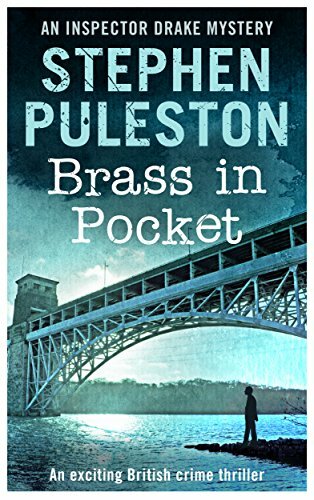 In Brass in Pocket, Inspector Drake is called to a crime scene where two policemen have been murdered – with a crossbow. An array of traffic cones has been arranged by their car, forming the number “4”. And then the killer sends the police a message, consisting of the lyrics of a 1970s rock song. Struggling with lack of sleep and his need to carry out his personal, calming rituals, Inspector Drake, with his team, follows every lead they can find to stop a killer who’s constantly a jump ahead of them, as the numbers count down and the rock lyrics keep coming in. The solution, when they find it, is almost unthinkable. The OCD element in the book is intriguing, but it wasn’t enough to make it work for me. Drake and the other characters just didn’t come alive. Physical descriptions were rare, and the players were hard to tell apart. The suspects completely blended into one another, for this reader. My perceptions may be skewed, however. It’s possible that, since I have certain obsessive characteristics myself, I just found Drake’s character too close to home, and reacted against it. But I found the plot hard to keep track of, and the story undistinguished. So I can’t recommend it. Your kilometerage may vary. Are you familiar with the Inspector Rutledge series by the mother and son team writing as Charles Todd? Rutledge is a British veteran of WW l afflicted with a near crippling case of shell shock. He is haunted with the ongoing taunts of a solder under his command during the war. Rutledge found it necessary to perform a battlefield execution of this man. There’s a long list of titles. I quit the series because I found his torments distracting and annoying. But the writing is excellent. No, I’ve never read those. Sounds pretty dark.